This weekend saw the announcement of a seventh ship for Disney Cruise Line, which will serve to expand their potential areas of operation in the world market quite significantly. One of a trio of new 2,500-berth ships to be built by Meyer Werft at Papenburg, all three will be LNG-powered. 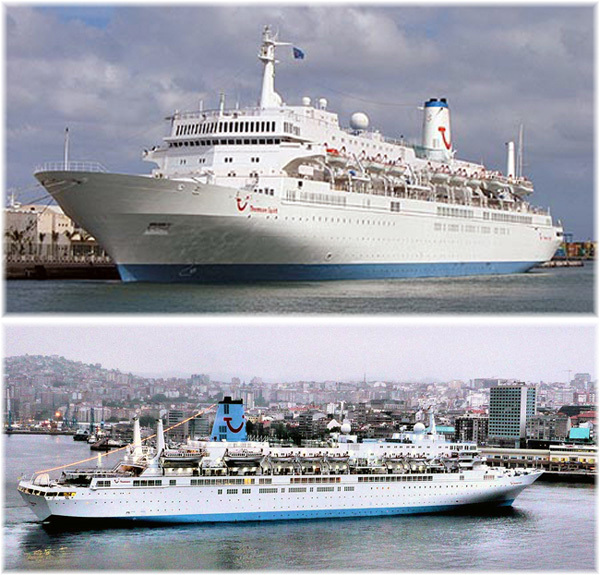 Elsewhere, Thomson Cruises has announced that it will retain an old favourite, the Thomson Spirit, for one more season in 2018, despite that fact that it is introducing the 1,870-berth TUI Explorer in the same year. And in the Australian cargo-passenger trades, four of the five existing CMA CGM Europe-Australia ships are being transferred to ANL’s Singapore-Australia service. Two German-owned ships will replace the four leaving the Europe-Australia service, meaning a 60% drop in passenger capacity. Disney Cruise Line will be adding three newbuildings to its fleet in 2021, 2022 and 2023, it was announced on Saturday. This will add a third ship to previous plans which had called for vessels to be delivered in 2021 and 2023, and a seventh ship to the fleet overall. 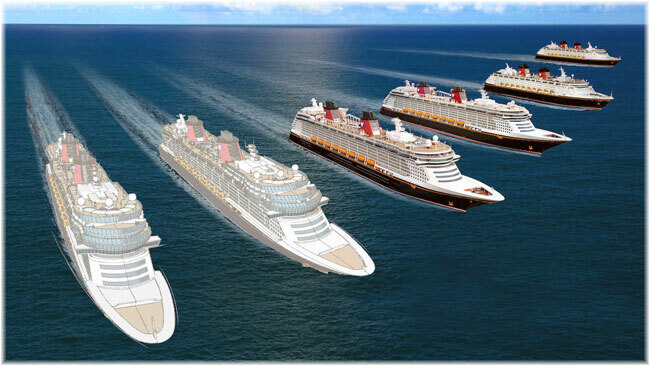 Each ship will be 135,000 gross tons with 1,250 staterooms, giving a passenger space ratio of 54 cu ft per passenger per ton, although given the high number of upper and children’s berths in Disney ships, this would drop quite substantially with a full ship. 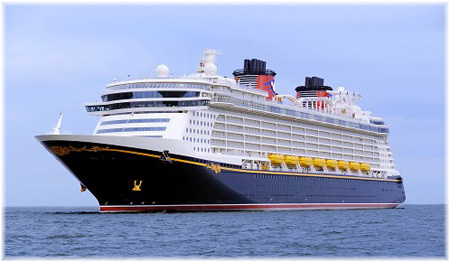 The exisiting Disney Dream (2011) and Disney Fantasy (2012) have 1,250 staterooms and can accommodate up to 4,000 passengers. When full, this produces a passenger space ratio of 34 cu ft per passenger per ton, on par with the average mass market ship. The new Disney trio will be built by Meyer Werft in Papenburg, and will be powered by liquefied natural gas, a first for Disney. Thomson Cruises will increase its cruise fleet capacity next year by retaining the 1,254-berth Thomson Spirit for one more summer season in 2018. This boosts the company’s capacity as previous plans had the Spirit leaving the fleet after the 2017 cruise season, to be redelivered to her owners, Celestyal Cruises. According to Cruise Industry News, retention of the Thomson Spirit will add around 10½% in passenger potential for the company in 2018. Thomson will now be able to accommodate around 400,000 passengers at double occupancy. Operated on charter, the Spirit was built in 1984 as the Nieuw Amsterdam for Holland Ameirca Line and has been part of the Thomson fleet since 2002. She will be based out of Malaga from May through October, with an April season from Palma. Thomson cited customer demand for the decision to keep the ship for another summer season. The Spirit has become somewhat of a favourite in its sixteen years with Thomson. Thomson and the TUI Group are building up UK passenger capacity. 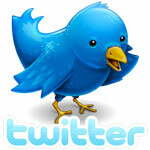 New-to-Thomson ships are being added on an annual basis through 2019. 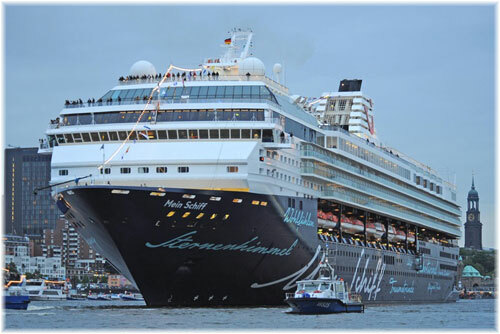 The 1,870-berth Mein Schiff 1 (ex-Galaxy) and Mein Schiff 2 (ex-Mercury) will join the fleet from German affiliate TUI Cruises in 2018 and 2019, to become the TUI Explorer and TUI Explorer 2, respectively. In April 2016, it was announced that six new ships, five from CMA CGM, the 10-passenger CMA CGM Bellini and her sister ships CMA CGM Chopin, Mozart, Puccini and Rossini and one from NSB, the 7-passenger MSC Monterey, would join the Europe-Australia route from London Gateway via Suez to Australian ports. The five CMA CGM ships were assigned to the North Europe Mediterranean Oceania Express (Nemo) service and the NSB ship to MSC’s Australia Express. Now, fifteen months later, everything is changing again, with four of the five CMA CGM ships switching to Australian National Line’s Asia Australia Express (AAX) service between Singapore, Port Kelang and Australian ports. The CMA CGM Chopin will remain with the Nemo service while two 5-passenger NSB ships replace the four that are moving to AAX. The first of the NSB ships, Conti Lyon, joins the Nemo service at London Gateway tomorrow, July 18, and the Buxcliff will be arrive at London on or about August 18. Each of the NSB ships has an Owners cabin, a double cabin and a single cabin for passengers. Effectively, this means the Nemo passenger service is going from five ships with a total of 50 passenger berths to three ships with only 20 berths, a reduction of 60% in direct capacity to Australia. One solution to this is to take a fast Far East container ship to or from Europe and change ships at Singapore or Port Kelang for Australia.